Gold has reached an all time high, while some people deter from buying, others believe it is always a good time to invest in buying the yellow metal. The love for the yellow metal doesn't die even though it comes with sky rocketing price tag that comes alongwith it. People love gold and will continue showing their affinity towards adorning it. The buying may shrik a little but will definitely not fall deep. Rise in gold prices can be attributed to various reasons- Global Crisis, Economic growth Data from various countries, rising unrest in Syria etc. The weekly gold prices fluctuate due to data released from various countries which directly affect the bullion prices. Moreover when the world is under turmoil, everyone wants to be on a safer side and there is no better option than gold which has always proved to be a safe haven asset and has given highest returns compared to other assets in its class. This heavy buying has also been cited as one of the reasons in increase in gold prices. But in relation to the international prices, the domestic prices of gold have comparatively surged much higher. This is due to the depreciation of the rupee against the dollar. Falling rupee along with increased duties has peaked gold towards its life time high. As the gold demand/supply gap widens against supply, central banks can help fill the widening supply gap with easy-rate gold leasing to keep the market price of gold from rising too fast, or in a reverse scenario of an imbalanced gap against demand, to raise gold leasing rates to slow flow of gold into the market to keep the market price of gold from falling too fast. Demand for gold is majorly categorised into three sections-Industrial demand, Investment demand and demand for Jewellery. Supply of gold comes from mine production, recycled gold and central banks. Of these, central banks play an important role in filling up the demand supply gap for gold. Rice of any commodity is decided in the basis of its demand vs supply. When the demand for gold is much higher than its supply then the central banks offers gold at easy lending rates in order to increase its supply in the market and fill up the imbalanced gap against demand. And in a reverse scenario, it can increase the lending rates of gold in order to curb its supply and thus prevent the prices from falling further. If we see the Indian markets, here gold is culture. Here the basic mentality of an Indian is that invest your money in GOLD FIRST....other things can wait. And more so, it’s an age old tradition of buying gold on auspicious occasions like Akshaya Tritiya, Dhanteras and Diwali. Any marriage in India is incomplete without the purchase of gold- be it any form- jewellery, coins, bars etc. Moreover, keeping the price movements in mind, many believe that prices of gold will reach new heights. Keeping this hike in mind the find it wise t buy gold even if it’s at its life time high. As per the World Gold Council, last year was a milestone year for gold as global demand for the yellow metal grew 0.4 to 4,067 per cent. One ton at an estimated value of $205.5 billion -- the highest tonnage level with a value exceeding $200 billion since 1997. The increase was mainly propelled by the investment sector, particularly in India, China and Europe. In the first quarter of fiscal 2012, gold demand was at 1097.6 tons, a five per cent year over year decline. Increase in investment demand was offset by declines in demand for jewelry and in the technology sectors, due to higher prices. Central banks continued to be purchasers of gold, accounting for around seven per cent of total gold demand, at 80.8 tons. 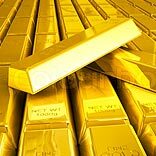 However, in absolute terms, gold demand in the quarter was valued at $59.7 billion, a 16 per cent jump compared with the first quarter of fiscal 2011. Average gold price in the first quarter stood at $1,690.57. This was 22 per cent above the prior fiscal’s quarter. In value terms, all the sectors of gold demand posted growth, barring physical bars and the official sector. Investment demand posted robust growth in the quarter, particularly led by ETFs and similar products. Gold demand in the technology sector was at 107.7 tons, a seven per cent decline year-over-year due to higher gold prices, weak consumer demand, higher inventories and the uncertainty in Europe. Jewelry demand dipped six per cent to 519.8 tons due to higher price levels. The 22 per cent higher quarterly average price suggests that jewelry demand is not directly related to price. Value of jewelry demand grew 14 per cent to a record $28.3 billion. China, Russia and Egypt recorded growth, while weakness was witnessed in India, a number of Middle Eastern markets and in Europe. Jewellery demand in India, otherwise a major consumer of gold, was down 19 per cent and investment demand declined 46 per cent. This was mainly due to a sharp decline in the rupee, which led to higher local prices, rise in import taxes on gold and imposition of excise duty on jewellery in that country. However the excise duty was later withdrawn by the government. Gold in India is currently at an all-time high in rupee terms.